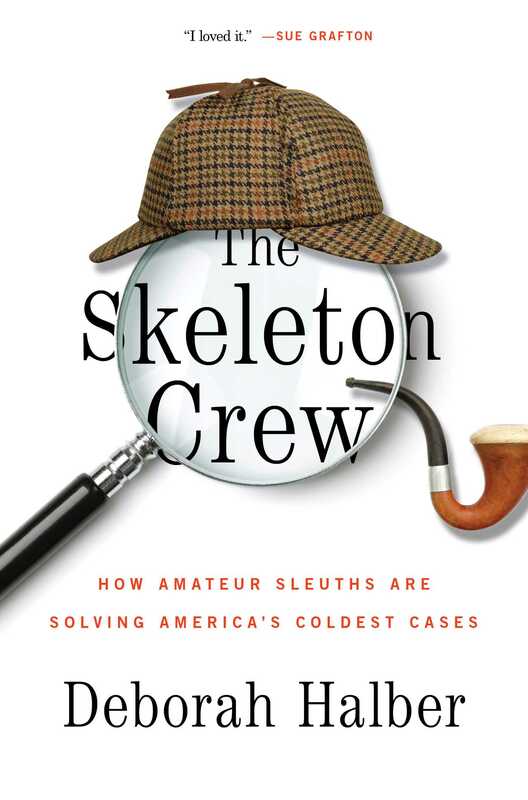 The Skeleton Crew provides an entree into the gritty and tumultuous world of Sherlock Holmes–wannabes who race to beat out law enforcement—and one another—at matching missing persons with unidentified remains. In America today, upwards of forty thousand people are dead and unaccounted for. These murder, suicide, and accident victims, separated from their names, are being adopted by the bizarre online world of amateur sleuths. The web sleuths pore over facial reconstructions (a sort of Facebook for the dead) and other online clues as they vie to solve cold cases and tally up personal scorecards of dead bodies. The Skeleton Crew delves into the macabre underside of the Internet, the fleeting nature of identity, and how even the most ordinary citizen with a laptop and a knack for puzzles can reinvent herself as a web sleuth. I’m looking around a Cracker Barrel in Georgetown, Kentucky, wondering if I’ll recognize him. The only photos I’ve seen of Wilbur J. Riddle were taken four decades ago, when he stumbled on the corpse wrapped in the carnival tent. He was forty years old then; with his tousled dark hair and strong jaw, he resembled Joaquin Phoenix with sideburns. Even in black-and-white, Riddle looked tanned, a shadow accentuating the taut plane of his cheek. His short-sleeved shirt unbuttoned jauntily at the neck, he stood slightly apart from three pasty, grim, steely men with buzz cuts, dark suits, and narrow ties. They seemed preoccupied, dealing with a body where a body had no right to be. Throwing the photographer a sidelong glance and a faint smirk, Riddle alone seemed cocksure and unfazed. In time, he would end up just as invested as the Scott County sheriff and state police, if not more so. He would become the father of sixteen and grandfather of forty and would still be escorting people out to the shoulder of Route 25—X marks the spot—where he found her. Somebody might have been tempted to charge admission. He’s thought about asking the state of Kentucky to put up a marker along the guardrail: the Tent Girl memorial plaque. She’s a local legend. Parents invoke her—an unidentified murder victim whose face is carved onto her gravestone—as the fear factor that has hurried two generations of children to bed on time. But she’s more than that. Tent Girl drew me in. As I delved into the world of the missing and the unidentified, her story would transform the shopworn whodunit into something altogether different—the whowuzit, I’ll call it—in which the identity of the victim, not the culprit, is the conundrum. Her story supplanted the tweedy private eye or world-weary gumshoe of my expectations with a quirky crew of armchair sleuths who frequented the Web’s inner sanctums instead of smoke-filled cigar bars. Her story was rags to (relative) riches, triumph of the underdog, and revenge of the nerds all rolled into one. Tent Girl, by becoming separated from her name, also invoked a murky psychological morass of death and identity where—judging from my companions’ faces whenever I brought it up—most people would rather not go, but that I felt perversely compelled to explore. There are a dozen versions of the story of Wilbur Riddle stumbling upon Tent Girl. Some newspapers had him trip over the body instead of merely notice it. The victim’s age was sixteen or twenty; she was five-one or five-eleven; she had a white towel draped over her shoulder or wrapped around her head or there was no towel at all; Riddle tore open the bag and looked at her before the police arrived or he stopped what he was doing as soon as the odor hit him. The pulp classic Master Detective magazine told Riddle’s story, calling him “Bart Cranston” throughout. I go to Kentucky in 2011, forty-three years after Tent Girl’s discovery, and scan the Cracker Barrel customers milling around the sock monkeys and dishtowels and handmade soap. The place smells like lilac and frying bacon. Finally, I spot someone with a receding hairline and doughy cheeks whose mouth, I imagine, reflects that younger man’s smirk. The man I have figured for Riddle nods at me; maybe he’s been interviewed so many times he can easily pick out the writer in a room full of nostalgic kitsch. He’s wearing a crisp blue windbreaker, button-down shirt, khakis cinched tight with a brown leather belt, and running shoes. He’s trim, his gait stiff but quick. We’re seated at a booth and Riddle orders the country breakfast, scrambled eggs and a biscuit smothered in pasty white gravy. Coffee mugs are refilled and people go about their business apparently unaware of Riddle’s fame, even though this particular Cracker Barrel is less than ten miles from where he found her. He peers at me over the plates and scowls when I mention a documentary being made about the case. “I wish they’d get it over with and let the girl go. They done enough,” he says, and I think maybe he’s sick and tired of the whole sordid affair. But then he starts to tell me what happened on May 17, 1968. Riddle drilled water wells for a living. He arrived at a work site—a new Gulf station near a minuscule town called Sadieville—on a pleasantly sunny Friday morning to find a note plastered to the windshield of his Chevy truck. The towering scaffolding of Riddle’s drill rig was stowed, its hydraulics, levers, spindles, and winches idle after Riddle drilled “way down pretty deep” the day before, as he recalls, without hitting much water. The note instructed Riddle to hold off on any more drilling until the boss arrived. The planned gas station was situated at the off-ramp for exit 136 of the brand-new four-lane Interstate 75 running from Kentucky’s southern border to its northernmost tip. The interstate would link the county to one of the busiest highways in America, supplanting nearby US 25 as the major thoroughfare heading east to Cincinnati and west to Georgetown, the county seat, with its ornate General Grant–style courthouse. US 25, two narrow lanes that still meander past limestone ledges and hug a tributary of Eagle Creek in Sadieville, spans a literal shift, between Kentucky and Ohio, and a figurative shift, from the South to north of the Mason-Dixon Line. Around a month before Riddle showed up for work that day in May, four hundred miles away in Memphis, James Earl Ray had gunned down Dr. Martin Luther King Jr. as King stood on a balcony of the Lorraine Motel. In the days and weeks following the assassination, fires and riots erupted in more than a hundred cities, killing forty and injuring thousands. A light-infantry brigade from Fort Benning, Georgia, was called out to Baltimore the day after the shooting to help quell looting mobs. Among the army recruits on high alert at the base was slight, dark-haired nineteen-year-old James William “Billy” Matthews, whose son would one day compete with Riddle over Tent Girl like knights jousting over a maiden. In Scott County, the bucolic countryside was dotted with sleekly muscled Kentucky Derby contenders munching unnaturally green turf behind fences so white they hurt your eyes. The creatures’ placidly whisking tails could lull you into believing that most bad news originated very far away. Riddle, Kentucky born and bred, inherited his bad-boy looks and blue-collar profession from his father, who could find water during even the driest stretch of summer, when local streams were nothing more than dusty furrows. Riddle’s father taught him the secrets of the divining rod. You held on to a slender, pale switch from a beech tree, and when you went over a vein, the tip—the base of a letter Y—dipped straight down toward the earth as if something powerful had grabbed hold of the other end. Riddle also learned where to collect jugs of pure clear spring water that bubbled up from the ground year-round. In 1789, one such spring had provided the water for a Baptist minister’s new concoction called Kentucky bourbon whiskey. It was this fabled system of underground springs that Riddle intended to tap at the construction site. The note on Riddle’s rig bought him some free time. As he drove up that morning, he had spotted linemen working on utility poles around a quarter mile from where the gas station was being built. He left his red Ford pickup—his shop truck that rattled with tools—parked beside the rig and ambled a few hundred yards toward Route 25. At the intersection with Porter Road, workmen were stringing cable. Even tiny Sadieville, consisting of a train station and not much else, was getting connected to the modern world. Maybe, Riddle thought, he could score some of those old hunks of glass his buddy was so fond of. First made in the 1850s for telegraph lines, by the 1960s glass insulators were outmoded, regularly discarded from utility poles and snapped up by collectors. Roughly the size of a diner sugar dispenser, mushroom-shaped or with protrusions like Mickey Mouse ears, they came in brilliant blues, greens, and reds, and collectors had rude and fanciful names—snotties, globbies, comets, boulders, hockers, fizzies—for the objects and air bubbles frozen inside the glass. The mercury was edging up, portending a glorious spring day. Riddle wore his standard work uniform, a short-sleeved, greenish-gray collared work shirt, chinos, and a zippered jacket. After collecting his shop truck to cover more ground and searching pole to pole along the creek, he was juggling an armful of insulators when he spotted a bundle tucked partly under a big rock next to a dead redbud tree. Something lumpy was wrapped up in a dark green tarp, the ends secured with rope tied in square knots threaded through round brass eyelets, on the creek side of a sagging waist-high fence around twenty paces from the roadway. The fence, strung with a single strand of barbed wire, skirted the edge of the gravel pull-off where Riddle had left his truck. The hot, muggy spring had spawned weeds and wildflowers that gave off an acrid aroma, and the air was abuzz with all manner of flying and crawling insects—woodland ground beetles; gawky, long-legged assassin bugs; iridescent blue cuckoo wasps—and a dozen kinds of flies. Something about the shape of the bundle struck Riddle. He approached the dark green bundle, put down the hunks of glass on the rock slab, and looked more closely. It was around four feet long, lumpy, wrinkled, and V-shaped, as wide around as a small tree trunk. Later, some would surmise that the bag had been first set down on the rock and then hoisted over the fence, a snag on the barbed wire leaving a slit in the fabric. Riddle saw something inside. An animal of some kind? He nudged it with his foot, then tugged on a corner of the tarp. It teetered on the edge of the embankment and then rolled around thirty feet into a gully, and he followed it. He stepped on the tent. Something inside felt hard through the sole of his work shoe. Then he noticed a slit, maybe a foot long. A stench wafted through the torn fabric. The odor was overwhelmingly bad, knock-back-your-head bad, like fishing bait left too long in Tupperware. The smell helped Riddle guess the worst; in any case he was in it now, too late to continue on his way back to his truck and prepare his drill rig as though it was just another day on the job. He was alone at the bottom of a steep embankment, trapped on one side by a creek too wide to pick his way across, with only birds and bugs for company. Had he called out, no one would have heard him. As the bundle rolled, the tarp had come away. He took a step closer. For a few minutes that must have felt longer, Riddle stood next to the bundle considering his predicament. A thousand flies flitted about. Unseen by Riddle, the squirming larvae of thousands more were at work within the bag at his feet. It was quiet. The utility workers were gone. No cars passed on Route 25. He stood down where she was for a while, thinking what to do. “If I was to leave and someone was to come in there and see a body in there, they might have thought I had put it there,” he reasoned. He wasn’t a criminal but his past wasn’t lily-white. He had seven kids and a third, young wife at home. Riddle was a ladies’ man and a maverick—­defiant, as some put it—and there were those who might wish him ill. He had no idea who was dead at his feet. If he raised the alarm, would he change from Wilbur Riddle, onetime bartender, known rogue, and womanizer, into Wilbur Riddle, Scott County good citizen, or Wilbur Riddle, murder suspect? He had to think this thing through. Finally, abandoning the glass insulators on the flat stone, Riddle scrambled up the embankment to the pull-off where he’d left his shop truck, climbed behind the wheel, and screeched off for Sadieville’s nearest operating filling station, a Chevron. He slid coins into a pay phone. Cruising in my rented Toyota along Route 25, Riddle and I retrace the path the sheriff, deputy sheriff, and coroner took from the Georgetown courthouse that day. Over in the passenger seat, Riddle seems complacent. He’s pushing eighty-five, yet despite his many missing teeth making him sound like he’s got a mouthful of marshmallows, his remaining hair is slicked back neatly and his shirt is ironed. The whiff of cologne drifting toward me reminds me of Riddle’s reputation as a ladies’ man. I sense him eyeing me. “You from Ohio?” he asks after a bit. “Boston,” I remind him. “No.” I think uneasily about the signs I had spotted on the highway: JESUS IS COMING. ARE YOU READY? and HELL IS REAL. An enormous billboard challenges in three-foot-high letters: IF YOU DIED TODAY, WHERE WOULD YOU SPEND ETERNITY? The nearby Creation Museum, with its display of animatronic dinosaurs playing with children in the Garden of Eden, comes to mind. There’s something we can agree on. “I don’t want to go to hell,” I say cheerfully, and luckily we have to confer on which direction to turn at the next traffic light. We arrive at the Gulf station, now an empty lot with a faded remnant of the old orange sign, where he had shown up for work that day. A minute later he directs me to pull over near a guardrail that wasn’t there in 1968. The shoulder is a weedy patch of grass. The fact that the former clearing was once the first pull-off available to northbound drivers exiting the highway at the Sadieville interchange was not lost on investigators. Riddle climbs out of the Toyota and lumbers through the underbrush. He squints toward the creek. It’s April, but it snowed last night. Hints of green poke through white patches on the brown leaves. I follow a few steps behind Riddle, who is zigzagging through the brush. “Here it is,” he says, pointing to the flat rock where he first saw the bundle. He knows it’s the right one because he’s taken to leaving a rusted old knife blade on it for occasions like this one, when someone asks to be shown, once again, exactly where he found her. That day in 1968, after reliving the morning’s events for the state police and watching the body disappear into the ambulance, encased in something like a carnival tent (within days, The Cincinnati Post would dub her Tent Girl), Riddle sped twenty-five miles to the dilapidated farmhouse where he lived in Monterey, in Owen County. As he talked about it decades later, he seemed to have suspected that something life-changing had happened to him that day. Two months later, in July 1968, Billy Matthews, the young Tennessean undergoing basic training at the United States Army Infantry Center at Fort Benning, was deployed to Vietnam. A year later he returned home with a Purple Heart, and he and his wife conceived a child. Tied, perhaps, to Billy’s exposure to Agent Orange in the Vietnamese jungle, the infant they named James Todd Matthews was not robust. But unlike two of his siblings who would succumb to congenital defects within hours of birth, Todd, dark-haired and dark-eyed like his father, survived, and surgeons later patched up his damaged heart. Todd wouldn’t encounter Wilbur Riddle or Tent Girl until two decades after Riddle had stumbled on the body. The well driller was still dining out on the story, carrying a well-worn copy of Master Detective featuring Tent Girl as “the most baffling case in Kentucky’s criminal history” and himself as the heroic “Bart Cranston.” Todd—single-minded and sensitive, artistic and shy, a bit of an oddity among his teenaged Tennessee peers—started dating Riddle’s daughter and, to the Kentuckian’s consternation, ended up stealing away—to Wilbur’s mind—seventeen-year-old Lori and Tent Girl. By the time his son-in-law got hold of the case, I remind Riddle as we drive away from the roadside gully, the mystery of her identity was decades old—frosbitten, as cold cases go. Riddle doesn’t seem to hear me. Deborah Halber is a Boston-based journalist whose work has appeared in The Boston Globe; Technology Review; the interactive, illustrated digital magazine Symbolia; and many university publications. A native New Yorker, she received her BA from Brandeis University and an MA in journalism from New York University. A member of the American Society of Journalists and Authors, Mystery Writers of America, and the National Association of Science Writers, she has chronicled breakthroughs in neuroscience, molecular biology, energy, and technology at MIT and Tufts, but is most enthralled with “quantum weirdness,” worm longevity, cell undertakers, and the properties of snail slime. Visit her at DeborahHalber.com. "A compelling glimpse into a little-known subculture inhabited by a colorful cast of the idiosyncratic, the quirky, and the downright weird." "In this highly addictive story-within-a-story narrative, Deborah Halber skillfully exposes the complex Internet subculture of amateur sleuths. The people who obsess over the fates and identities of Jane and John Does are puzzles in themselves, which adds a fascinating layer to this captivating book. The Skeleton Crew will likely inspire many more case resolutions." If you like tales of discovered body parts, heads in concrete in buckets, corpses whose hands have been cut off, decomposition, decay and death, then this fascinating, riveting book is for you. "Halber's intriguing book ought to bring in lots more volunteers."